Under the theme of ‘Ideas’ CongRegation 2018 the three day ‘mind mesh’ festival this year further expanded to include 7 different events as part of the weekend. This was the sixth year of the event that witnessed over 100 Irish and international speakers debate, discuss and share their expert insights into the world of ‘Ideas’. Consisting of 8 separate events over the weekend in 10 different venues the conference featured an evening of talks in Ashford Castle, Adults Physics Workshop, Full Day Unconference, Children’s Smart, Music and Drumming workshops, a learn the Ukulele music workshop, poetry recitals and finishing with foraging walk in Cong wood. 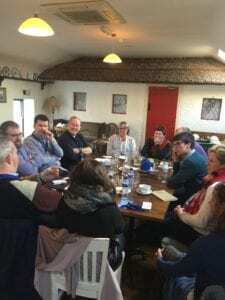 The centre piece of the weekend is the unconference which saw coffee shops, book shop, art gallery, restaurants and shops in Cong Village turned into mini conference centres or ‘huddles’ with attendees debating Ideas from the perspective of artificial intelligence to how to get ideas off the ground. This year also saw the launch of a problem solving muse for attendees. Over the course of the event attendees simply entered a problem at www.thypia.com and a creative muse delivered an anonymous personalized response. 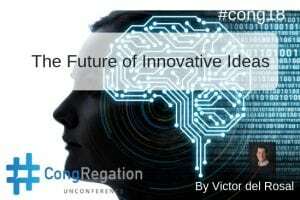 Once again, tickets were earned through the submission of a 600 word unique article on the theme of ‘Ideas’ that is posted on the conference website. In total 97 articles were submitted using a range of mediums (audio, video, written) and format (from poems to quotations). Ashford Castle and Physics Workshops. This year the proceedings started with 5 International and Irish speakers sharing their unique insight on the world of ideas. This was followed by a ‘Semi-Conductor’ workshop in Cong Village. The full report and video is available here. 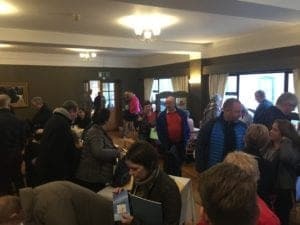 Gathering in Ryans Hotel from 9am on November 24tha split of experienced CongRegation attendees mingled easily with first timers, as tips for the day and how to read the timetable were expressed. After a quick orientation by Eoin Kennedy the 100 attendees broke up into their randomized groups in 8 different locations. This year included the newly opened Byrne & Butler, the relocated Rare & Recent Bookstore along side Pat Cohans bar & restaurant which remaining open for a longer season. Ryan’s Hotel, Puddleducks Cafe, Elizabeth Toghers Gallery and Danaghers Hotel completed the list of locations. Each location was managed by a specially briefed chairperson who guided proceedings. Each session opened up with an ice breaker, which ranged from life tips, business guidance through to IT tips. Frequently the ice breaker became the talking point of attendees as they floated between the 4 different sessions. At each session 3-4 people were invited to speak for 10-15 minutes with moderated Q&A. Attendees decided where, when and how they presented. The talks were generally ‘off the cuff’ or a verbal chat through the article the attendee has submitted. As the time available is short speakers focused on the strongest and most salient points which acted as a catalyst for conversation and connection. Fueled by free flowing tea/coffee/pastries and lunch, attendees moved after each 1 hour huddle to a new venue with 12 new people until everyone has spoken. The fourth huddle finished at 4.30pm with the customary photo at Cong Cross and a short thank you address, before retiring to Ryans Hotel for drinks followed by dinner in Pat Cohans and other venues. The children’s workshops at Congregation started as a way of easing the pressure on parents of attendees but have now grown to be a stand alone event. Over 36 children attended the ‘Smart Fabric’ and precussion workshops in the Crossroads Community Centre. Delivered by Shirley Coyle of Common Ground Design, the smart fabric workshop started by allowing children to design their own clothing on cutout models before exploring how to embed sensors into clothing and experimenting with different fabrics from slow vanishing UV light designs. Mixing motor skills (sewing) with technology (embedded diodes, sensors) the morning session was spent making and experimenting. 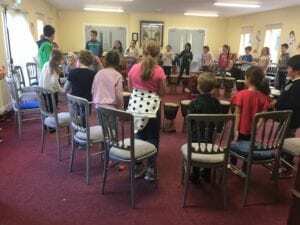 Following a lunch from Byrne & Butler and a movie showing the group of children again assembled under the expert tuition of Anthony McNamee of One World Drum for a percussion workshop. The two hour workshop ended with a 20 minute concert for the parents where the entire group worked in a coordinated drumming master class. 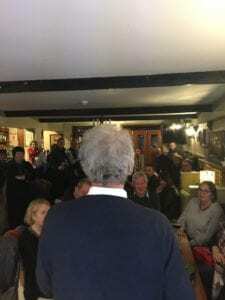 Following a request from John Davitt, who had published a book of poetry, a stand up session was introduced to this year preceding after the conference dinner in Danaghers. The session was MCed by Paul O’Mahony who guided the poets through rapid fire recitals by John Davitt, Richard Millwood and Anne Tannam (both whose pieces were written for their fathers) and this years youngest attendee Caoimhe May. A number of impromtus recitals were also delivered by including Karl Thomas, Gillian Godsil and Celia Keenaghan. Fears about the reception the poetry session would receive were unwarranted as the audience listened with rapt attention. Having delivered a master class on the bodhran and harmonica in previous years, Sean McGrath once again pushed the limits further with a ukulele workshop. Focusing on the basics Sean has the entire group playing the instrument with minutes and finished up a with group composition. He also left the group with no just the enthusiasm to play more but a full set of resources to continue the learning journey. The impact of the deep sharing from the conference, the emotional experience of the poetry sessions and the fun of music playing was evident in the free flowing interaction amongst attendees that continued late in to the night. One of the things that make CongRegation special is the beauty of the physical surrondings of Cong Village. A quick trip through the 12 century abbey and across a wide stone bridge, with leaping spawning salmon leads to the Cong Woods which was the location for a foraging walk guided by Alex, a cook in The Lodge Hotel. Over the course of 2 hours under blue skies and sunshine he located edible mushrooms, salad ingredients and natural flavouring in the ancient forest. With opportunities to sample nature’s bounty he shared how they use the ingredients in the kitchens in the hotel. As a free event CongRegation relies on sponsors to underwrite the cost of organizing and running the event. However it is important to have sponsors who buy into the ethos of information sharing balanced with commerce. This year sponsors have all supported previous years and delivered support beyond financial contributions. Their ongoing support and engagement is very much appreciated. I would personally like to thank Mayo.ie (www.Mayo.ie), the Advanced Productivity Skillnet (https://icbe.ie/skillnets/advanced-productivity/) MKC Communications (www.mkc.ie)and Blacknight https://www.blacknight.com. 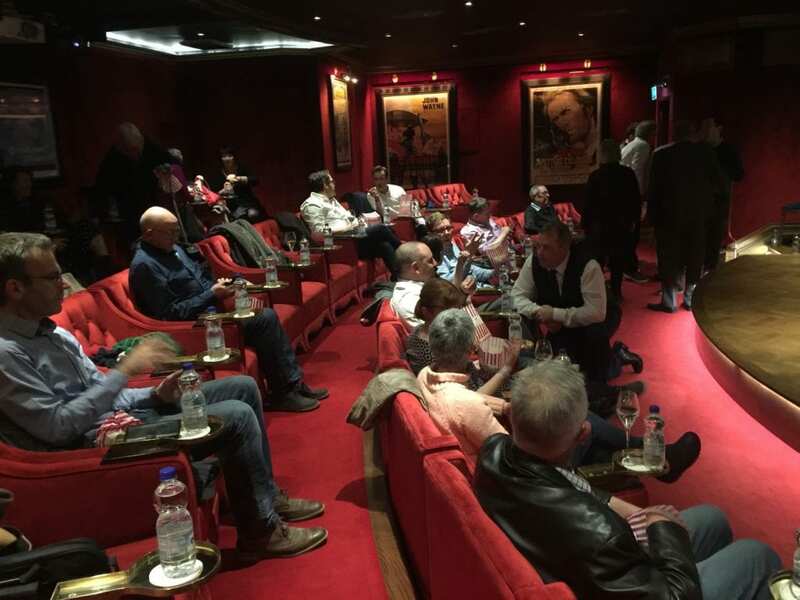 The fact that there is only 32 seats in the private cinema in Ashford Castle is the biggest weaknesses and strengths of the beginning event of CongRegation. The luxurious surroundings and the ‘pulmanesque’ seating allows for a level of intimacy that connects speakers and attendees closely but the night is always oversubscribed. 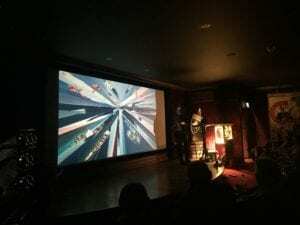 This year five speakers shared their unique stories of ideas in an evening which started with a prosecco reception in Ashford Castle’s Connaught Room. Daphne McKinsey stared the evening with a presentation exploring fear and its impact on ideas noting that sometimes we need to completely step away from an idea before we can reassess and implement it. Generating something new challenges us and Daphne’s story behind the Sean Edwards Foundation deeply resonated with all. Daphne lost her son Sean in a tragic motor accident which inspired her to create a foundation that would improve driver safety in the motor racing sector. Daphne also shared the plans for a new communications and collaboration platform that could revolutionise driver to spectator the safety with enhanced first responder and incident data. 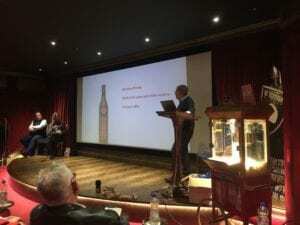 Peppered with a lifetime of tips and stories of products he developed David Gluckman shared insights on what inspired new gins, vodkas and wines. Contrary to a systems led world he suggested that ‘sometimes it helps to take something right to the wire. The cold sweat of panic can concentrate the mind wonderfully.” The search for ideas is a 168 hour a week undertaking he also noted. “Wherever you look, you can find something. Just keep looking” said David describing how he has found inspiration from ordinary things like a crossword puzzle. He also told attendees to look at the information you already have rather than continually looking for new data. David also revealed that for him the process of ideation it was “never a team game’. Acknowledging the role of buyers of ideas he advocated the need to learn how to buy as well as sell ideas. David finished up with a final piece of advice for all to implement the morning after test on ideas – what seems like an inspired concept might not seem like such a good idea the next day. Speaking without slides but based on a lifetime of stories from working in the media Valerie Cox shared how headline grabbing stories come about. By pulling bags of rubbish out of ditches around the country, searching for clue of ownership she tracked down dumpers to interview them for ‘Ditch Watch’. Over 5 years this caught nationwide appeal and radically changed behaviour. Aligned to this she also narrated uncovering a series of illegal dumps based upon following up on rumours that led to high court actions. She also spoke about gate crashing wedding for scoops to following numerous lines of query to gather enough information to make a story worth while. Valerie also shared how the media worked to extremely tight deadlines that forces journalist to rapidly work contacts, gather information, turn them into a coherent narrative and make them readable. The life of a journalist is not for everyone with its multiple rejections and sometime dangerous reactions. 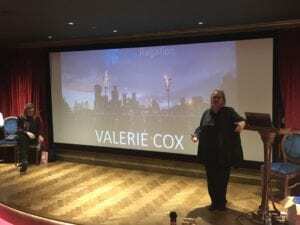 One of Valerie’s final stories was on revealing the practices of Irish psychics that prayed upon people vulnerabilities after weeks of recording interviews. 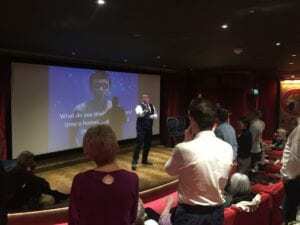 Lee Tunney Ware in his presentation on ‘New Mindsets = New results’ used a series of audience participations that had everyone on their feet to demonstrate the connection between know and believing. ‘We do not see things as they are, we see them as we are’ he said acknowledging the role of belief over perception. He brought the exercise home to attendees by asking them to see how many ‘F’s they saw in a sentence. Most missed a couple of them demonstrating that the mind does not always see everything. Lee maintains that beliefs are the barrier to truth and are only summary commands. He finished up telling the audience that ‘your limits only exist in the mindset that created them’ and encouraged everyone to take a new and open view on what they could achieve. The evening finished with Joan Mulvihill narrating her new journey as an artist. Joan was better know to the attendees as the CEO of the Irish Internet Association and more recently as centre director of IC4. With only 24 hours to prepare for the presentation she also discussed the role of ‘fear’ and ‘acceptance’ of exposing new ideas. Illustrating the progression of her paint from photo realistic to more emotion fueled impression she articulated the movement from ‘Someone who can but someone who doesn’t…..’ to ‘Someone who can and someone who does…’ She also questioned who decides if someone is or isn’t something. When is someone a Musician, author, Poet, Comedian, an Entrepreneur or in her situation an Artist? Is it defined by the ‘effort’ or the ‘output’? The reaction by the attendees to her work answered some of this but people willing to buy her work was perhaps a better indicator. She also spoke about embracing how some people will hate her work and the honest feedback this provides. She finished by talking about the difficultly of giving something away that she has created, although financial payment helps. 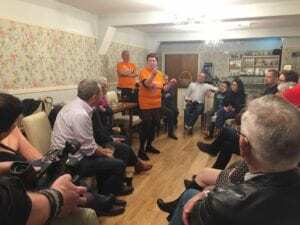 Following the evening in Ashford Castle the group retired to Danagher pub where Mags Almond, Richard Millwood, Chris Reina and Stephen Howell brought the group through making simple electrical circuits and explaining the role and function of diodes, conductors, semi-conductors. By using the now infamous fluffy chicken Pieu Pieu showed how our bodies can act as conductors followed by hands on making of glowies. In the course of 20 minutes the impact on sparking curiosity, understanding and questioning was clear to the attendees and even clear how this can be transformation for children. Deep electronics concepts through fun and experience. 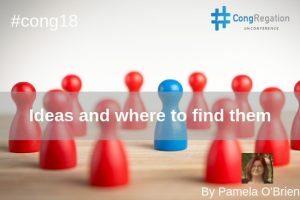 Almost 100 submissions were published this year in the run up to #cong18 on Nov 24th under the meta theme of ‘Ideas’ and due to the diversity of insights grouping them into common sub theme is a challenge. Some submissions were specific from tips on remembering ideas to more psychology led analysis of what constitutes an idea. Attendees were given a blank canvas on which to map out their unique perspective which was a difficult task as it involved distilling and focusing their thoughts on a broad and complex area. Many people reported spending long journeys pondering their thoughts before committing to paper. The process of writing these thoughts down takes discipline but also deeply embeds the learning. Kick off this year Alan Costello articulated the learnings from recording an idea every day in The Power of One Learning Per Day. 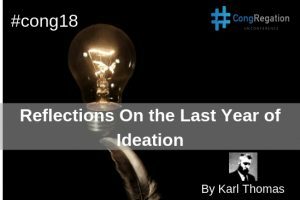 Karl Thomas supplemented this with his insights of a year of Ideation in Reflections On the Last Year of Ideation proposing that if you ‘lack’ creativity, get good at communication and collaboration. Richard Millwood reflected on how taking a contrary approach can uncover new thinking in Being Contrary. Sabine McKenna gave some granular tips for remembering ideas from writing them down and creating memory hooks in Ideas and How to Hold on to Them. Carol Passemard in Ideas and the Eagle proposed that often ideas arise through “need or problem solving” whether it was the need to change, make money or because something is broken. The complexity of simple ideas by Mags Almond spoke to how a simple change can harness the insights of all especially in groups. In his second submission Want bigger ideas? Ask bigger questions! Alan O’Rouke explains that the ideas you generate are constrained and shaped by the questions you ask. 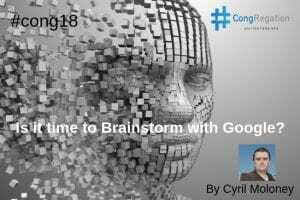 In an era of google and AI Cyril Moloney points out that ideas will be a precious commodity that we need to invest in now to avoid disruption along with where ideas come from in Is it time to Brainstorm with Google? Through a video submission and a selection of Ideas quotes Paul O’Mahony in I have no idea looks at how ideas happen reminding us that before our idea were our feelings. Asking if Are All Ideas Instinctive? Romain Couture explores the conflict between reason and instinct. Emphasing the importance of ideas Tom Murphy advocates that if we didn’t have good ideas we would have been done away by evolution in Evolving Ideas. 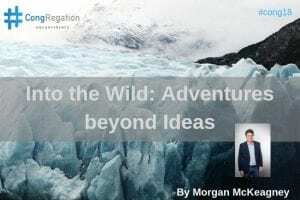 Maryrose Lyons proposes that Average people talk about people, great people talk about people’s ideas but extraordinary people talk about ideas in Average? Great? Or Extraordinary? Revealing how he blends old school writing ideas in moleskins before calling them out and using voice transcription and AI for surfacing the best ideas Bernie Goldback also proposes sharing your ideas through immersive experiences in While Talking to Myself in My Attic. Gillian Berry tells us that Translating ideas into meaningful contributions is a challenge worth taking in Necessity is the mother of invention- A 360 reflection while also advocating self belief and freeing yourself from constraints. Using his years of running Maker Workshops, Chris Reina suggests we should embrace our Maker spirit and share with others in We’re All Makers and Learners! 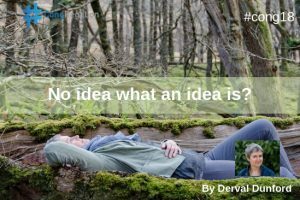 Derval Cunningham shares the essential elements for the generation of ideas covering a Quiet Mind, Space, Time and Connection in No idea what an idea is? Encouraging people not to give up on ideas Aoife Keady shares that the best ideas develop when you see a future for them or more importantly when you cannot see a future without them in I Cannot Sleep At Night Until I Have At Least Tried My Best To Bring An Idea To Life! Stan Kuznetsov encourages kids to generate ideas, read more books, stay away from modern media and take time offline in The Idea of Unblemished Mind. Adding to voice of encouraging ideation in children Sinèad Curran advocates allowing children to be in control of themselves and being mindful of how we use negative and positive reinforcement in At what age should we be allowed to have our own ideas? Listening to those reoccurring ideas is important – they push you to do things outside your comfort zone and drive you to do things you wouldn’t normally do. Unshakable ideas happen for a reason and are a sign you need to act on them says John Reilly in Are you thinking what I’m thinking? 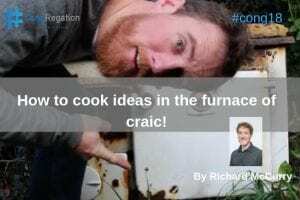 Emphasising the role of fun in ideation Richard Curry tell us about the How to cook ideas in the furnace of craic! 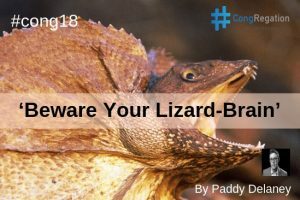 In addition to documenting our internal survival instinct Paddy Delaney also advocated that for ideas to become actual Idea they required some form of action in Beware Your Lizard Instinct. Simon Cocking advocated reading books for ideas and taking time away from the screen. Eileen Forestal in Ideas – 10 a penny …. or are they worth their weight in gold ? spoke about spreading ideas. Reflecting on the managing constantly ideation Ailish Irvine in “This time next year Rodney” advocated you win some, you lose some. 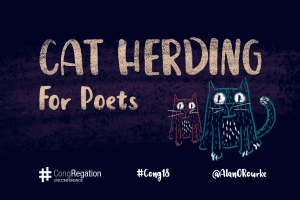 Alan O’Rourke in Cat Herding For Poets encourages us not to fall in love with our idea and to find a partner who will go “Oh oh” to add some realism. With a focus on execution Michelle Gallen takes the unusual route of rewording a poem in Thirteen Ways of Looking at an Idea. Noreen Henry advises being being the thinker and the doer in Ideas Won’t Put Food on the Table! In Ode to a Cracked Pot Idea Joan Mulvihill encourages us to be generous with our talents and share our ideas. Failing to think straight by Bernard Joyce tell us we can further develop our creativity in developing out ideas by giving ourselves the permission to fail intelligently when we try out new ideas. 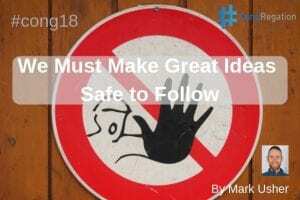 Mark Usher in We Must Make Great Ideas Safe to Follow tells us that our ability to thrive depends on our capacity to find the courage necessary to follow our greatest ideas. John Tierney shares his experience of ideation noting that sustainable idea development needs funding and a team in What Is. Getting team buy-in, timing, testing, prototyping, evaluation, end-user validation and at the very minimum an objective, critical discussion with the right people are all critical factors in enabling ideas to move forward according to Anne Wilson in What is a Good Idea? Aileen Howell questions the barriers to ideas becoming reality in Where do ideas come from and where do they go? Sharing the experiences of implementing the ideas from Scaling Up by Verne Harnish John Horkan tells us how his company has made ideas become reality in Ideas are not Enough! Emphasing the pressure and lack of resources Helena Deane tells us that difficult situations test our tenacity and make for better problem-solution analysis in Necessity is the Mother. 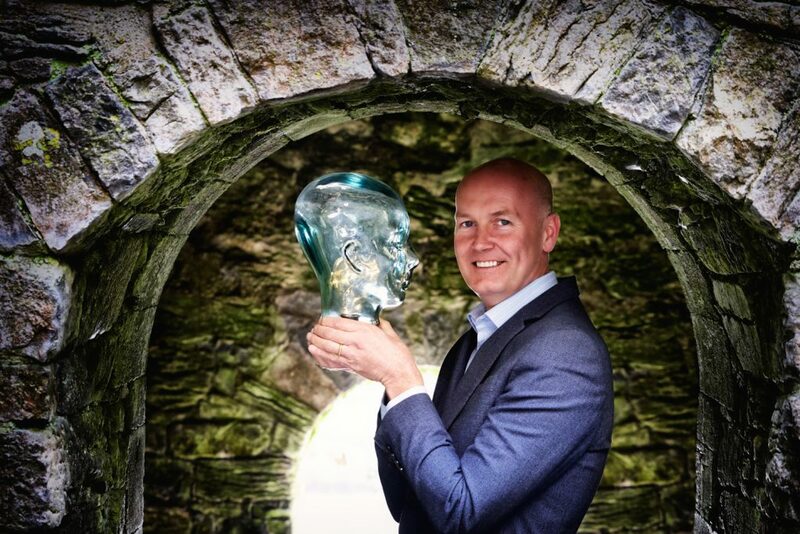 Using his own recent experience in his business Paul Killoran explains that when the stakes are high, implementing ideas can be difficult and your gut instinct can count for a lot in Ideas of Burst No Pressure. Asking and answering the hard questions of Where does the word idea come from? What does the word idea mean? What does it mean to have an idea? Anne Tannam in Fresh into Ideas covers deep thought processes. 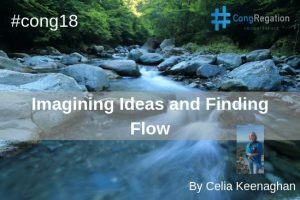 With deep insight psychometric testing Celia Keenaghan in Imagining Ideas and Finding Flow guides us to that finding your flow is finding your path of least resistance and your path to greatest impact. Lee Tunney Ware tells us we have the power to make the changes we want if we would only change our mindset in Ideas | Where do they come from? Using the theory of Charles Horton Cooley and the concept of the Looking Glass Self Jane Leonard explains how your idea of who you are is not just a biological state but is the result of our interactions with others in The Idea of You and Me. We need to connect to and express our emotions to change the limits of our language and our world and challenge specific ideas of manhood which distorts and limits our ability to act in the world says Dermot Casey in a second #cong18 submission in Killing John Wayne. 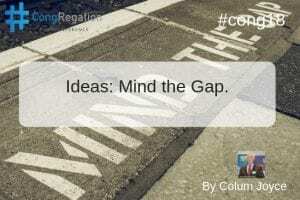 Colum Joyce articulates some new thinking on how Innovators can get better returns from their Intellectual Property with new thinking in Ideas: Mind the Gap. In Ideas for Sale Alec Taylor probes the “successful handover” of one of our ideas to someone else and the role of legacy in a lifetime of ideas. In My Business Partner Is 57 and doesn’t understand me Seanie Walsh suggests that the power of ideas, is not in what you say but what you’re listening to before revealing that validating his thoughts through an adult in the room taught him that there was as much value in mapping trajectory to discovering an idea was totally useless and moving on. Ginger Aarons shares her 20 years of developing ideas in the tourism industry and investigates what happens when you’re idea is no longer THE ‘new idea’ in It seemed like a good idea at the time. Clare Dillion in Technology Evangelism – the discipline of spreading good ideas in a digital world explains the three main competencies in evangelism – craft the message, spread it engage and support communities. 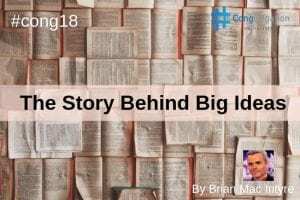 Brian MacIntyre shares a lifetime in the media and the symbiotic relationship between Stories and ideas in The Story Behind Big Ideas advising that if you’re looking for that next big idea, figure out what the world needs fixing. Joy Redmond adds realism to the mental health debate in It’s time for Some Real Suicide Ideation and advocated more honest debate. Frank Walsh grabbles with the difficult but real notion that all ideas come at a cost – generally to our planet in Ideas: Killing the planet since the year dot? 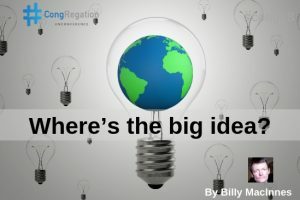 Ideas are being stifled by the straitjacket of consumerism and the market and as a result, really big ideas are in short supply suggest Billy MacInnes in Where’s the big idea? Rural Communities need a vision that’s strongly held says Tracy Keogh in Spreading Ideas where she articulates the impact that remote working could have. Mary Carty asks what would possibilities could we create if we revaluated old ideas and broke away from old frameworks in Ideas that Bind. What possibilities could we create? In Dear Fellow Inmates Caoimhe O’Rourke uses a poem to share new ideas on openness and dialogue on mental health. In Opening the door to creativity Eva Action ask how does our education system fosters ideas encouraging the breaking of the mould, tapping into talent and learning to fail again/fail better. 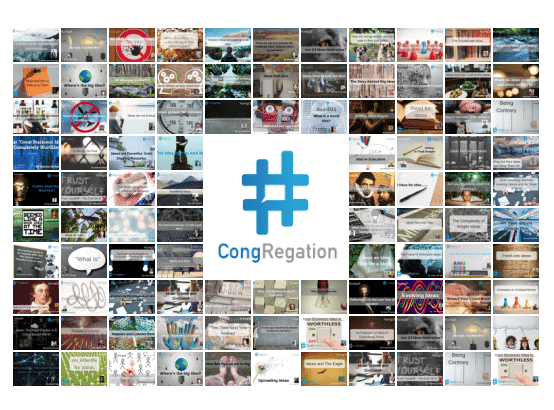 CongRegation has morphed and grown since the first incarnation experiment in 2013 although the fundamental structure of what makes it special has remained the same. One of the key things that changes annually has been the theme and interestingly the original theme of ‘Social Media’ still features strongly in some people’s perception of the event. Let me take you through the evolution to this years theme. The first year focused on social media which as a sector was still evolving and needed lots of discussion and guidance. We gave options to people about submissions ranging from Case Study, Tips, How to Guide through to a what was called a ‘Rant’ (positive or negative perspective on the topic). Most submissions took the form of a leadership type piece essentially a smart positive rant, where opinions were given space to be elaborated, dissected, reassembled and made ready for discussion. It was clear that this was the type of contribution and form that people were naturally more attracted to but is the most difficult of all the options. It takes time to narrow down the vast choices, percolate the ideas, build a reasonable case, research, compose, edit, test, rethink and finally submit. This single choice of submission was carried into year 2 but the theme broaden out a bit to include digital media, partially as a reaction to the broader nature of year one submissions. Rather than just document work done, attendees wished to dig deeper and ponder the topic at a more challenging level, rather than just deliver a blog post that could have featured on a regular social media blog. This was the what I saw as the emergence of what I called the ‘Mental Itch’. We are surrounded by all the theme areas but we rarely really question them or construct our thoughts into a robust argument or stance. In a world of twitter, microcontent and limited attention span long form content forces us to consider things with a bit more depth, sometimes to quite personal self reflective areas. We are also all incredibly busy and possibly don’t reward ourselves with higher debate and thinking when stuck in the now. Year 3 became a bit more challenge focused with the theme exploring the impact of technology on work and personal lives. This evolved from conversations at year two as personal impacts were questioned. As the diversity of attendees expanded and as the curious nature of attendees grew there was a collective desire to look at something bigger and tap into the collective mindsets. If my observation from year two was around the general willingness to tested (submission and conversations on the day) year 3 taught me that the more meaningful content frequently involved peeling back layers of the onion to really see what, who was ticking. This happens naturally during the day in Cong but year 3 contributions contained not just smart insights but also deeper personal perspective. Year 4 ‘The Future’ emerged as a natural extension of the Year 3 theme of the impact of technology on our lives. Technology has a role but it’s not the only player in town and year three surfaced a lot of fears and reservations that people had about the future direction we were heading. An attempt to capture on the day insights in the form of an open challenge to create a better future was also attempted but these themes are so big, multi faceted and broad that consensus is almost impossible to achieve. In fact, we could not even reach consensus on who should get the award for best contribution (the crystal ball is still sitting in my office). Addressing the final challenge on the day of producing ideas on what would make a better future proved difficult as the more views on the future that emerged the more questions that accompanied it. The ‘Innovation’ theme of year 5 reflected the emergence of ‘meta themes’ and could be viewed as an additional component of the convergence between technology and future. This allowed the flexibility to explore experiences, expertise and scratching of the mental ‘itch’ – something that was always nagging you at the back of your mind that you wished to explore more deeply. The compliance aspect of the submission (ie cannot get a ticket without it) was replaced by sometime cathartic release of energy and focus on a blank canvas topic. CongRegation creates a peer based, trusted environment to explore areas and it was heartening to hear challenges to conventional wisdom and counter intuitive approaches. As the attendee profile also broadened so did the entry point and background perspectives. The range of angles, perspectives, commentary, guidance and strong opinions reinforced my own internal view that everyone has a piece of the jigsaw puzzle and no one has all the pieces. Last years theme of ‘Ideas’ proved difficult for people as not alone do we rarely think about ideas in an external inquiring stance but we generally live in the moment of having an idea and the problems it poses. 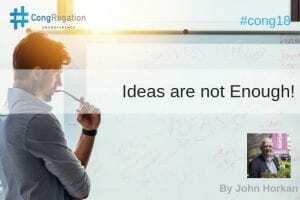 Ideas is related to the Innovation theme but interestingly many felt that Innovation had become abused as a concept due to over use – words matter. Similar to innovation, executing on an idea was a key exploration thread. In normal life this theme gets superficial treatment and is often interwoven into bigger fabrics. 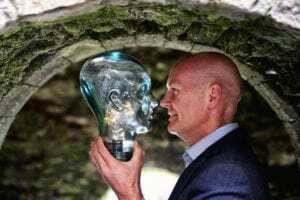 David Gluckman’s presentation in Ashford Castle and his comments about Ideas alerted me to this rich vein – if we just viewed it differently and pondered it more deeply. Rather than a collection of idea pitches the submissions contained a mix of well thought out reflections and probings. Fear: this popped up in a lot of huddles, would connect in a very deep way but also risked becoming very personality focused. Transition: This originated from a conversation where it was felt a lot of people at CongRegation has experienced change or were undergoing deep self reflection (career, life). Community: In its seventh year is CongRegation becoming a community that takes place in a rural community. The date and theme were put out as a Twitter poll (not the most scientific way but I wanted to make it a bit more objective) and Community was the clear winner. 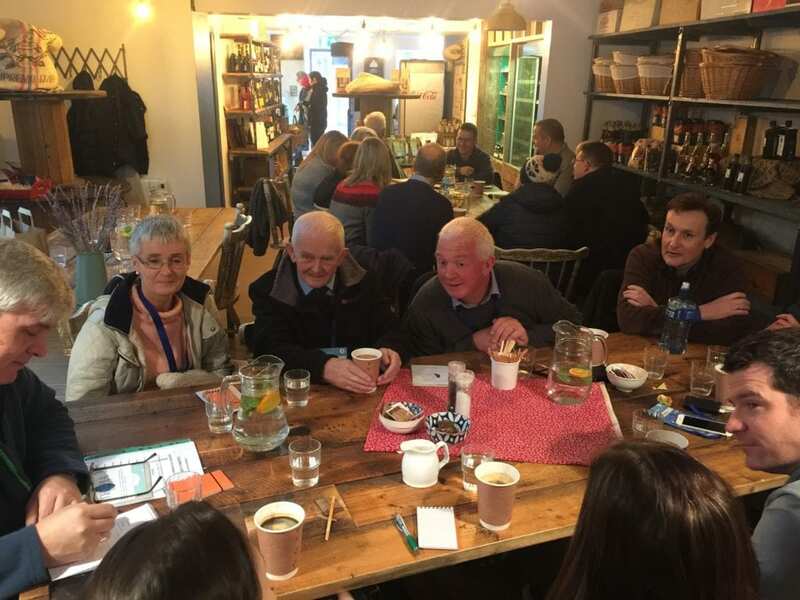 Over the last year I have had many conversations with Tracy Keogh about community from a business perspective from how do you define it, to the different perspectives to the joys and problems of working with communities. I have lived in rural and city communities, in communities in different culture China, Spain, Canada. I worked with different work communities and communities of practice. I have watched online communities grow from the early email lists and the fascinating worlds that evolved and have become the tail wagging the dog. I live in a rural community but see multiple levels, complications, fantastic endeavors, open mindedness, closed mindness to completely unconnected groups. Everywhere I look I see tribes, formal/informal groups of people and witness the same people behaving in completely different way. Community surrounds us, united us, it drives and moulds us and we rarely question it deeply. My curiosity is only now starting and I like all the contributors have permission to think, reflect, express and share our insights. Only starting also is the awareness of how much I have to learn about this arena. Since agreeing the theme I have had fascinating conversations with sociologists about community and place, the evolution of communities through migration and the view/power of filtered, collated research to explain what I see daily but do not necessarily understand. As per Joan Mulvihills comments I have become hyper alert to community related topics to the point of having email conversations with a poet who featured on RTE Sunday Miscellany, straight after the show as he had a unique perspective on a community where I lived. Coffee time discussions have uncovered doctorates who have tried to implement industrial standard on to a rural community to try improve the community. Psychologist friends fascinate me on the way the thread multiple theories and thinking into explain how and why we operate in groups and communities. Personally I am really excited about this theme, I am looking forward to being challenged, reflecting, researching , wondering, writing, scrapping, sharing, testing and I hope, like all the contributors, that this process along will enrich me a little bit more. Each huddle will have a chairperson who manages the session flow and ensures time keeping and interaction. The chairs role is to kick start proceedings, encourage the three/two speakers and more importantly enjoy the session. The principal behind small huddles and using social venues is that it is supposed to replicate real world conversations rather than artificial presentations from a podium. We have structured to avoid chaos but your judgement of the group is paramount and there is lots of flexibility built in. You do not have to an expert on the theme but your view is also important so you can decide to contribute or not. Some people will be quite nervous and anxious while some will be very confident and naturally monopolise time. The range of people and topics is very broad so you will have a very diverse group who different backgrounds, interests, occupations and ages profile. 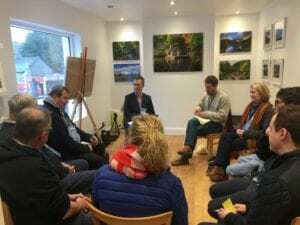 Your role is to make people feel comfortable, relaxed, manage the introductions, time manage the sessions, read the group and over all flow of the session. The real challenge will be to make it inclusive but this is no different to normal conversations in social situations. I really do appreciate your time and I hope you enjoy. I have included some guidance below which should help but also reading as many of the posts as possible will really assist you and they are genuinely very varied and interesting. RobbieCanavan | Byrne and Fallon | Two groups here. Lunch served. Padraig McKeon | Danaghers | One group in the café to the right. Lunch served. John Leonard | Puddleducks | One group. Table at the window. Lunch served. Don Delaney | Elizabeth Togher’s | One group. Round table. Lunch in Pat Cohans. Mags Amond | Pat Cohans | One group. Upstairs. Lunched served here. Averil Staunton | Rare and Recent | One group. Lunch in Ryans. Mike O’Rourke | Byrne and Fallon | Two groups. Lunch Served. Tony O’Kelly | Ryans | One Group | Upstairs area over the bar.Lunch served. Below are the instructions for the chairs but its also useful for everyone to understand the role/process. Huddles kick off at 10.30am so check out your location in advance ideally from from 10am. There will be max 10-12 people in each huddle but numbers may vary. There will be four huddles throughout the day according to the lanyard schedule. Kick off each huddle by introducing yourself. Explain overall running order – 1hr, introductions, life hack, two/three 10-15 minute talks followed by discussion after each one. Ask people to introduce themselves and give their ‘Life Hack: as an ice breaker. In their introductions people should state their name, what they do for a living but most importantly AVOID any sales pitches or overly lengthy life stories. Short and snappy is best and there is plenty of time during the breaks to dig deeper into work life and build connections. This might be a bit tricky at the start as people are unsure of how much they should say but encourage them too keep short. It works if you give an example with your own introduction. A ‘life hack’ is a tip from a productivity tip, social media tool or as broad as a philosophical tip on life. This is designed to get people talking to each other. Next up ask which three/two people would like to present. Explain that each speaker has 10-15 minutes to present and encourage everyone to contribute/ask questions. Some talks might go on longer/shorter but the key is to measure the atmosphere in the group. Occasionally the group have been happy to have just one speaker especially if it spawns engaged debate but best to try have a number of speakers at each huddle. Use judgement – if people are riveted to the speaker then allow more time especially if only 2 speakers. Ask if anyone is recording or streaming the session – just so everyone knows. Encourage people to tweet or post on social media using the #cong18. Explain that tea/coffee is available for them to use – let me know if supplies run low. Details for lunch venues will be on the lanyard. Start the clock when the person starts presenting. Remember everyone gets to speak on the day and needs a minimum of 10-15 mins and 5mins Q&A. Main thing to police is NO SELF PROMOTION – people will want to know more about you based on your insight. Give the speaker 3 minutes notice of the time with a hand signal. Thank the speaker and congratulate them. Some people will be nervous, some very confident. Encourage questions after the speaker. In general people contribute willingly. Synopsise or highlight some element from the talk as possible icebreaker. Ask a question of your own or add own experience if needed. If you are short a speaker consider calling out one of the posts from the site or ask if anyone wishes to present again. I don’t see this being necessary but looking at the blog posts in advance will greatly help you and personally I have enjoyed them. Politely move conversations on if one person is monopolising and watch for others who would like to ask questions/comment – see video. We have plenty of time to catch up on over runs during the day. Wrap up the session after the hour. If possible stick to the schedule as otherwise groups get bunched together. People have 30 mins to get to the next venue (which will take them 30 seconds) so they have plenty of time to chat. Ideally orientate yourself to Cong so you can direct people to their next huddle and be aware of the overall timings for the day. There is a map on the back of the lanyards. Finally enjoy. This is not the army, we have structure but only to ensure smooth running of the event – the two key elements you control are timings and flow of the conversations. This is a great bunch of minds so take your own mind for a gallop also. At registration I will explain how the spreadsheet (which will be on people lanyards) operates. The spreadsheet is built around 80+ people attending. This is spread across 8 venues running at the same time, with four sessions through out the day. If 3 people present at each huddle this means 96 presentations. Why is this important. It means you will have 3 presentations at some and 2 at others. If more or less people arrive on the day we will adjust accordingly – ie if 84 people show each huddle has to accommodate 3 speakers so that everyone presents. As people register we allocate a number to each person. They then use the spreadsheet to see what venue they are due in. This is done so that we can mix the groups up so in theory you will end up with an entirely new group of people at each huddle. I know this seems complicated but in reality it works out fine. Mathematically some huddles may be down some numbers especially if less people show so please bear that in mind. Some of the really enriched conversation took place in very small huddles. The first huddle is the hardest to get going and no one wants to jump straight in. A tip from Tony O’Kelly was to hover around the registration area to find some people who will be in your first huddle and agree with them in advance who will present. I will ask you to put up your hand at the briefing to introduce you and ask people to follow you out to the first huddles. Below is the spreadsheet which will be on people name badges/lanyards. Just in case you are wondering its upside down so when you till up to read it its aligned the right way up. The instructions for lunch is being served will be on the lanyard. The chair role is a busy one and you are on your mental tops of your toes all the time. However it is also a great opportunity to collate some of the key insights. After the session if you could document any of the key points it would be appreciated especially for the eBook report. I also intend to give away the glass head to the best contributor which will be a combination of most read posts and input from the day. Alec Taylor has kindly put together his tips for running a huddle. Worth watch especially for flow. 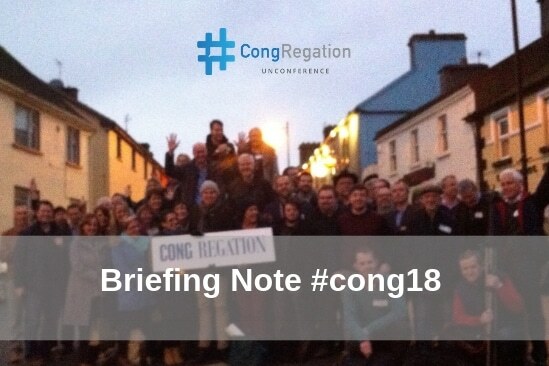 With just under two weeks to go to CongRegation #cong18 (Nov 23rdto 25th) I wanted to give you one centralised run down and briefing to make the event as enjoyable as possible. In total there are 7 events so this is a long read. Please take time to read and check the centralised registration link. 19.00-22.00 Night of Ideas Stories. Reception followed by 5 Presentations in Private Cinema. 22.30-23.00 Semicon(g)ductor Physics Danaghers Hotel. 10.00-10.30 : Opening address and move to venues. Themed under a ‘Night of Ideas Stories’ our speakers will share stories of growing ideas from small acorns into big movements, how the media processes ideas, perception and ideas and ideas from the inside. This event is fully booked out with a waiting list on the registration sheet. The venue can only hold 32 people so please check the sheet to see if your name is included. The full line up is the website. Also, please note although we may have a reception beforehand, please grab something to eat before you get there as we won’t be serving food. There is a reception in the castle from 7pm with presentations kicking off at 8pm sharp. Parking is in the car park located behind ‘Cullens At The Cottage’ (on the right before the bridge entrance) as the hotel is fully booked. There will be a shuttle service from the car park to the castle for attendees who would prefer not to walk but it a 1 minute walk. After Ashford Castle we will retire to Danaghers where Mags Amond and Richard Millwood will guide us through conducting – electricity that is. Registration takes place from 9.30-10.00 in Ryans Hotel with huddles beginning at each of the 8 venues at 10.30 sharp. On arrival you will be given a number along with lanyard. Your number and the spread sheet tells you what venue you will be in and at what time. Each venue has a chairperson who guides proceedings and will be completely briefed. The chairperson will ask 3 people to volunteer to speak at each huddle. You have 10 minutes to discuss your topic, followed by a 5 minute Q&A. You choose how, where and when you wish to present. This year we have a card/clock system in operation and you will be given notice of 2 minutes left (green) and 30 seconds to wrap up (red). Each huddle will kick start with a short introduction of who you are and what you do but please limit this to a few short sentences (plenty of time at the breaks to share more about you). The ice breaker is a ‘life hack’. This is tip for helping with personal or business life and could range from a handy online tool you use to philosophical perspective. This is designed to get everyone contributing from the start and is really helpful to all. The earlier huddles will start with 3 speakers and the later ones may have two but this all depends on the final number on the day. The spreadsheet on your lanyard is designed to try to ensure you meet new people at each session. Each session lasts one hour and you have 30 minutes to move to the next venue and chat with the other attendees. There are 4 sessions through out the day – two in the morning and two in the afternoon. We finish at 4.30/5pm with a group photo at the Cross in Cong Village. We will all congregate in Ryan’s Hotel for a post unconference reception. Dinner will be centralised in Pat Cohan’s with the over flow in Ryans/Danaghers and Lydons. 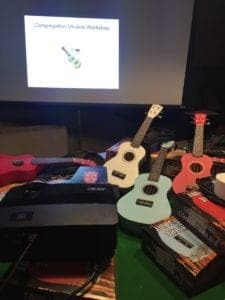 This year we are pushing the boundaries further with a unique chance to learn to play the Ukulele. We will have 30 Ukuleles at this fun workshop starting with the basics and finishing with a jamming session under the expert guidance of Sean McGrath. Many people are bringing their own instruments and we will have 20 for purchase @ €60 each with another 10 on loan. This session starts at 20.00. This is a great chance to meet some new people, create a piece of music and collaborate. 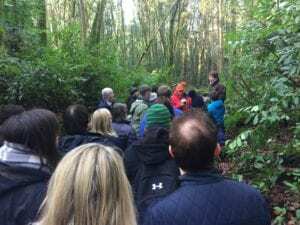 To blow off the cobwebs on Sunday morning there is a foraging walk through the beautiful Cong woods. Sturdy footwear and rainwear is advised. 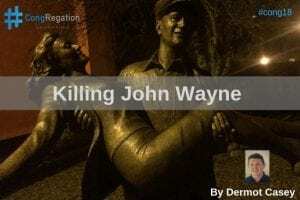 The gathering point is at the John Wayne Statue. Starting at 11 this gentle walk will take around 90 minutes. All venues have wifi but be warned it can be temperamental at best, so treat as a nice to have rather than guaranteed. Similarly on phone coverage, some sides of the village are better than others. You will have free tea/coffee in all venues and lunch on Saturday is all covered by the generous support of the sponsors – Mayo.ie, Advanced Productivity Skillnet, MKC Communications and Blacknight. Outside of the four venues (Togher Photo Studio, Rare and Recent book store) lunch will be in the last pre lunch venue. There is NO ATM in Cong but Ryans Hotel and O’Connor Spar shop do cash back but best to bring some cash with you. The nearest ATM is Clonbur Village about 5km away. Pat Cohan’s will act the main conference dinner location with over flows spread between Ryans, Danaghers and Lydons for dinner on Saturday night at 18.00. This really is a great opportunity to connect with each other and explore some of the areas discussed. There is a nice range of choices available and individual billing is available. We are expecting over 30 children for the ‘Smart Fabric’ and Percussion Drumming workshops in the Crossroad Community Centre on the way into Cong Village. You can check your children in from 9.30 and please collect them after the group photo before 17.00. You will be asked to sign your children in and out. Please let us know of any allergies in advance. We would like to take some photos/video of the workshop in practice. Let me know if this presents any difficulty. If you intend to avail of this I do need to know in advance. Food, drinks and movie at lunch time are all organised with a garda vetted minder overseeing the day so the children will be in good hands and have a blast. 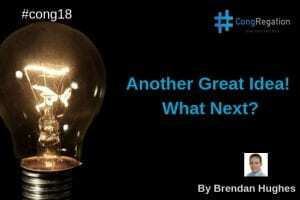 In preparation for #cong18 I really encourage you to read the other submissions and start the process of connecting with each other by either posting them on social media or commenting on the website. The range of perspective on Ideas is incredible and reading them in advance prepares you to discuss and find people you wish to meet. Personally, I have really enjoyed reading them. For any still to submit please send them to me as soon as you can or let me know how you are getting on. We are flexible on timing but really need to know that you will be there on the day. Please use the large car park at the entrance to the village or behind O’Connor’s Spar Shop/Garage (closes at 7pm) and behind Ryans Hotel. Please do notpark in front of Ryan’s Butchers and narrow points of the road (especially the front of Ryan’s Hotel) as large trucks have difficulty passing. Most people are driving to Cong and the list of those willing to car pool is on the registration sheet. If you are happy to take someone with you (great chance to get to know people) please let me know and similarly if looking for a lift please consult and connect with people. You should allow for at least three hours for the car trip from Dublin. If you are travelling by car for Friday evening in Ashford Castle my strong recommendation is to avoid Galway City and to detour off the Motorway for Claregalway, Corrundula and then back on to the headford road to Cong Village. This involves 20 mins of national roads but will save you a lot of time getting through Galway traffic chaos. On Saturday morning this will not be a problem. Let’s assume it will be wet and cold so please bring warm clothing and wet gear especially if planning on walks in the woods. As it’s a tourist venue Cong has a good supply of hotels and B&Bs but most of the immediate rooms are booked out. If you have yet to book please check out the listings on the site but a quick search will produce more options a short trip away in Clonbur Village. It is best to phone the hotels as they have block booked rooms for us. Taxi services are available to get back to your accommodation if outside the village. There are also some nice options on AirBnB. There are still places available in Ryans and Danaghers but these will vanish pretty fast. 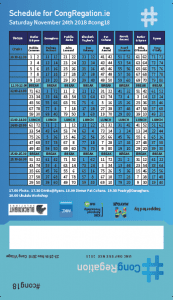 This year I am centralising registration on this sheet to give us rough numbers for each of the 7 events. This covers all the different events but the really important ones are Ashford Castle (we cannot squeeze any more than the lucky 32 in), the Children’s workshops and the Ukulele session (all can attend but we have only bought so many Ukuleles). Please check out the different tabs and put your names and numbers. 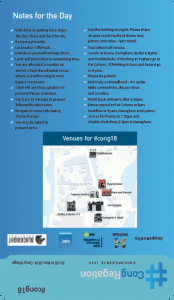 In addition, this year we are offering the services of a #cong18 problem solving Muse called Thypia where you can drop in whatever problem you are facing and our creative solution provider will deliver a personalised response to you by email. We cannot promise it will be the perfect answer but we do guarantee that a creative muse will review, analyse and give an anonymous response. You can start adding your problems now through this link but we will also have cards on the day that you can fill out. At this point we are on target for over 80+ attendees, 8 chairs, 30 children and some observers. Your attendance is really important to the smooth running of the event and if by any chance you cannot make it please let me as soon as possible as we will need to find replacements. It is also not too late for new people to attend so if you know of anyone please share this email, direct them to me or the website. In the event of something unforeseen happening could you please add your mobile number to the registration sheet or send to me. Finally, you are the heart of Congregation and I applaud your wonderful insights. Expect divergent views and opinions. I just ask you to be respectful but don’t shy from challenge and the richness of discussion this offers. This year I am also extending a challenge to the more confident to encourage the quieter voices through inclusive contributions. Please also take the guidance of the chairs who have a difficult task and only wish to have all voices heard. This event would not be possible without the generous support of Mayo.ie, Advanced Productivity Skillnet, MKC Communications and Blacknight and I would like to show my sincerely appreciation for their leap of faith in enabling this event to take place. I am really looking forward to seeing you in Cong and I really appreciate the great effort you are making in a taking the trip and producing some inspiring submissions. (01.11.18) The 6thannual CongRegation‘Mind Mesh’ in Cong Village from November 23rdto 25thwill see over 100 Irish and international speakers debate, discuss and share their expert insights into the world of ‘Ideas’. Consisting of 7 separate events over the weekend in 10 different venues the conference features an evening of talks in Ashford Castle, Adults Physics Workshop, Full Day Unconference, Children’s Smart, Music and Clay Modelling workshops, a learn the Ukulele bar music workshop and finishing with foraging walk in Cong wood. 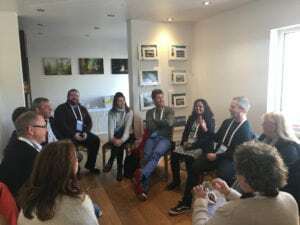 The centre piece of the weekend is the unconference which sees coffee shops, book shop, art gallery, restaurants and shops in Cong Village turned into mini conference centres or huddles with attendees debating Ideas from the perspective of artificial intelligence to how to get ideas off the ground. The price of entry to the 3 days of the conference is a 600 word unique article on the theme of ‘Ideas’ that is posted on the conference website. 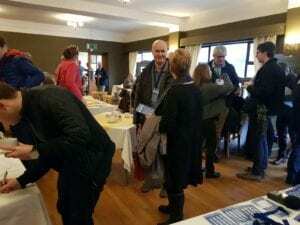 “The structure and the different events at CongRegation are designed to not alone share information more effectively but to allow the attendees to get to know each other better in a relaxed and informal peer based environment. These combined has produced lots of serendipity in previous years” commented organiser Eoin Kennedy. Speakers at the Ashford Castle evening of ‘Ideas Talk’ include business woman Daphne McKinley on establishing the Sean Edwards Foundation, Valerie Cox on her 21 years experience of ideas as a journalist in RTE, Lee Tunney Ware on what are ideas, David Gluckman, ideas innovator and inventor of Baileys and a poet on how the creativity community approaches ideas. This evening will finish with a Semicon(g)ductor Physics session with Mags Amond and Richard Millwood, where the attendees will literally try their hand at conducting – electricity. While the adults are enjoying the mind mesh in Cong Village on Saturday 24ththeir children will be enjoying a series of work shops including a smart fabric work shop by Common Ground Design followed by a music (drums) and finishing with a claymodelling workshop in the Crossroad Centre. 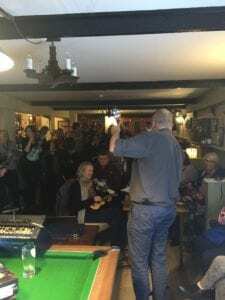 After the conference dinner on Saturday attendees will be taught how to play the Ukulele from scratch by Sean McGrath in Danaghers Hotel followed by a music session. CongRegation will finish with a foraging walk in Cong Woods on Sunday morning. “We are looking for open minded people with a curious mind, from very different backgrounds and an unique insight on ‘Ideas’ to submit their thoughts via the entry on the website,” added Kennedy. The event is proudly sponsored by Mayo.ie, the Advanced Productivity Skillnet MKC Communications and Blacknight. Congregation takes place in Cong, which is a small village in Co Mayo and home to The Quiet Man and Ashford Castle. Throughout the day coffee shops, bars and restaurants will be alive with people sharing stories and insights on this years’ theme of Ideas. Each session or huddle lasts one hour, with two in the morning and two in the afternoon and is moderated by a chairperson. A free ticket is delivered to attendees once they produce their submission paper and teas/coffee/lunch will be provided during the day. As each attendee is also a speaker so everyone who goes is a stakeholder and central to the event. Special breaks are built into the day to facilitate social interaction along with special semi-conductor, music and foraging workshops planned. Attendees can also send their children to the specially designed day long workshops. This the 6thyear of the event. Full eBooks on previous years are available to download.